You're sure to end up laughing out loud. It is the best of times, it is the worst of times - but your 20s are definitely not an easy time. In between sort-of adulting and learning to fend for yourself as everyone around you gets married and has kids, most of us would be forgiven for cribbing our way to our quarter-life crisis. But nothing like a dose of humour to help you navigate these tough times, right? Well, we collected a bunch of hilarious tweets that every desi 20-something will relate to. These are sure to make you laugh out loud. What irritates me after working 4 hours on week off is that kapde dhona reh gaya hai. 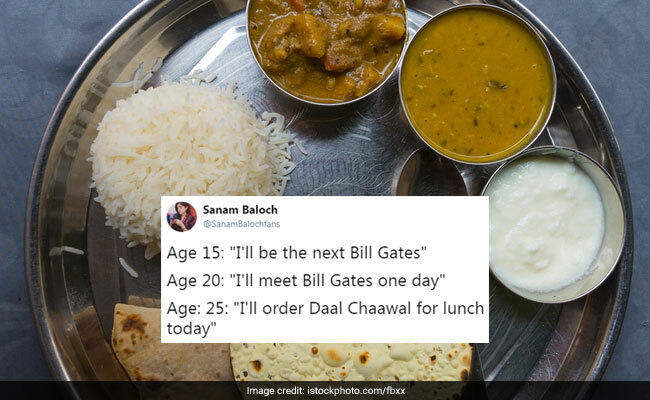 Age 15: "I'll be the next Bill Gates"
Age 20: "I'll meet Bill Gates one day"
Age: 25: "I'll order Daal Chaawal for lunch today"
21 "you're so young" 22 "you're so young" 23 "you're so young" 24 "you're so young" 25 "are you married? How's your career going?" Yesterday, an 11-year old in California graduated from College. How many of these could you relate to? Let us know using the comments section below.